Two new missions are available for download in Shin Megami Tensei IV, and unlike the rest of the game's extant DLC, this latest offering has plot consequences. Shin Megami Tensei IV is the latest entry in Atlus' long-running roleplaying game franchise. As with all SMT titles, it blends traditional, turn-based combat with demonic enemies that not only serve as punching bags for your coolest spells and shiniest weapons, but are also capable of becoming your best pal. I'm not here to review the game, but fortunately its critical praise has been nearly unanimous. Point being: It's a great game, particularly for RPG-loving Nintendo 3DS owners. As of this morning however, Shin Megami Tensei IV grew a bit. This isn't all that new, as DLC releases have been weekly events for the game since its debut, but what makes this latest offering so special is that it marks the first time a new mission has been added to the game that actually builds on the title's plot. The first DLC pack is entitled "Overlord Equipment," and it will set you back $1.50 if purchased from the Nintendo eShop. 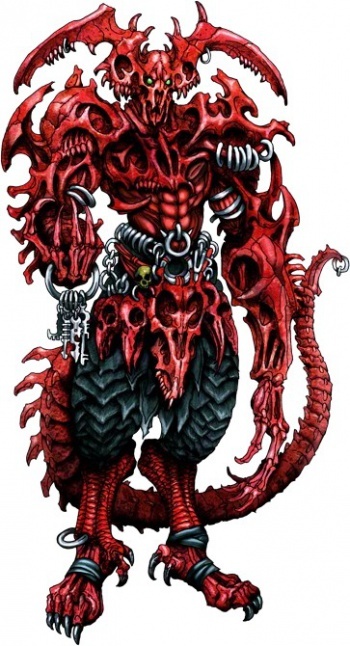 This download includes three new Challenge Quests that, once completed, award a full armor set patterned after the demon Asmodeus. That would be the angry-looking, red fellow with all the spiky bits in the image at right. The second DLC pack, "Clipped Wings 1," delivers that new story content I mentioned above. It only includes a single new Challenge quest, but by completing this task players gain the ability to fuse the angels Uriel and Raphael at will. It's suggested that players not attempt Clipped Wings 1 until they're toward the end of Shin Megami Tensei IV, but as long as you've got $2.50, you can pick up the additional content right this very minute. It's unclear exactly how this DLC relates to the main quest, but it is said to be canonically linked with the events of the original game. Will you miss out on crucial plot points if you don't buy it? Probably not, but you may get a bit more out of the story. The more DLC is released for this game, the more I realize how brilliant it was for Nintendo to offer gamers $30 for registering both Shin Megami Tensei IV and Fire Emblem: Awakening with Club Nintendo. Want to ensure that your players download as much DLC content as possible? Why not gift them enough cash to cover almost everything you plan to release right after they buy your game? It's so simple, yet so effective.